You can make a booking up to one week in advance, or you can ask to hire a wheelchair on the day of your visit. Slots are a maximum of two hours, so everyone can use them. 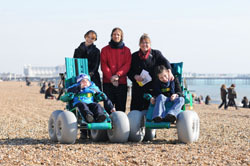 We will go through a few basic safety rules which you must follow when using the all terrain beach wheelchairs. If you have your own wheelchair we can store it while you use the all-terrain wheelchair. However, please note that the Seafront Office do not have a hoist available to transfer from chair to chair. Please contact the Seafront office for any further information and we will be happy to help. Changing Places are toilets with enough space for disabled people and their carers. We have one on the seafront at Collonade Toilets on Madeira Drive.